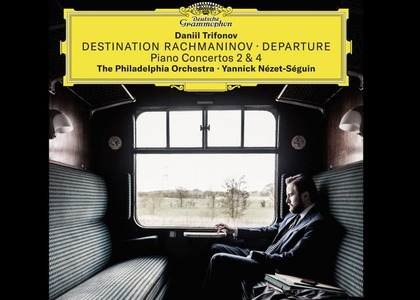 An eagerly awaited album which can be listened to for the first time at Radio Romania Muzical, just three days after its official launch on the international market, on 12th of October 2018: Destination Rahmaninov-Departure, featuring pianist Daniil Trifonov and the Philadelphia Symphony Orchestra, led by Yannick Nezet Seguin. An exciting name for the project which proposes all of Rahmaninov's pieces for piano and orchestra. The first volume, "Departure" includes concertos No. 2 and 4. The second volume, which will appear in October 2019, titled "Arrival", will include concerts No. 1 and 3. A long-awaited album for several reasons: firstly, Trifonov is currently one of the stars of the Deutsche Grammophon House, which staged a mega concert in the Forbidden City in Beijing on the 10th of October, with Trifonov as the headliner. Secondly, there is an ideological connection between Rahmaninov and Trifonov, which also presents itself in terms of nationality and spirit. Not only are they both Russian, but they both settled in the United States of America. In addition, Trifonov grew up as a pianist listening to Rahmaninov's performances, resulting in him acquiring a lot of Rahmaninov's pianistic style. Of course, Rahmaninov is one of the most beloved piano composers, himself a famous pianist whose favourite American orchestra was the one from Philadelphia, with whom he often played and premiered his pieces. This is a big part of the success of "Destination Rahmaninov". Those who attended Trifonov's concert in Bucharest in 2017, or listened to this concert on the radio, already had a preview of this album, since they both featured the same composition - Concerto No. 2 for piano and orchestra by Rahmaninov. Leaving aside the Bucharest version, the album version is more consistent in terms of construction, collaboration with the orchestra and conception itself. This version, performed by Daniil Trifonov and the Philadelphia Orchestra and conducted by Yannick Nezet Seguin, is worth listening to, if only to get a feel of how Rahmaninov would have himself in the 21st century - stormy yet lyrical, a master of changing states, very balanced but not without a subtle, romantic tone that results in a peculiar interpretation that manages to be youthful and mature at the same time. On this album, you will also encounter three parts of the Partita No. 3 for solo viola by Johann Sebastian Bach, in a piano transcription by Rahmaninov himself. A surprising choice, but well argued by Trifonov, who indicates that the polyphony in Rahmaninov's Concerto No. 2 for piano and orchestra is certainly Bach-inspired, and that as a pianist, Rahmaninov was a very good interpreter of Bach's music. Prelude, Gavot and Gig are the three parts of the Bach Partita No. 3 for solo viola, transcribed by Rahmaninov, imbued with a little bit of his unique style. Destination Rachmaninov is a two-part album, featuring the concertos for piano and orchestra of Rahmaninov. It is no coincidence that each part of Daniil Trifonov's album is comprised of a famous concerto alongside a lesser-known one. For the first volume, he joined the famous Concerto No.2 with the little known Concerto No. 4. Trifonov confesses that Concerto No. 4 by Rahmaninov is in fact his favourite. Completed in 1926, it demonstrates that Rahmaninov was also influenced by the music of that time - compared to the pure romanticism of Concerto No. 2, in Concerto No. 4 we discover a different world, full of modern accents, but painted with Rahmaninov's signature melodic talent. It is a score that deserves to be played more often, as noted by conductor Yannick Nezet Seguin. Actually, a lot of the album's success is owing to this conductor and the wonderful Philadelphia Orchestra - an ensemble that truly knows how to support a soloist in their performance. A great orchestra, a soloist and a conductor, all of which are, undoubtedly, among the most important of our contemporaries - a safe recipe for success, as indeed is the recording of Concerto No. 4 Op. 40 in G minor for piano and orchestra by Sergei Rahmaninov. The album Destination Rachmaninov. Departure can be heard on Radio Romania Muzical on Monday, the 15th of October, at 19:00 o'clock or anytime on the site of the 2018 Albums of the Year project.